Peebles Originals-Projects & Instructions. Build your own! This project was researched and designed by "PeebCon" (Peebles originals & Friends), and we have spent much time experimenting with, and building this speaker system. Many trials and errors were experienced before we had the perfect system. If you follow these building instructions, "exactly" as we have outlined here, you to can have an outstanding crystal radio loud speaker. I guarantee you will be very surprised as to how well it operates. 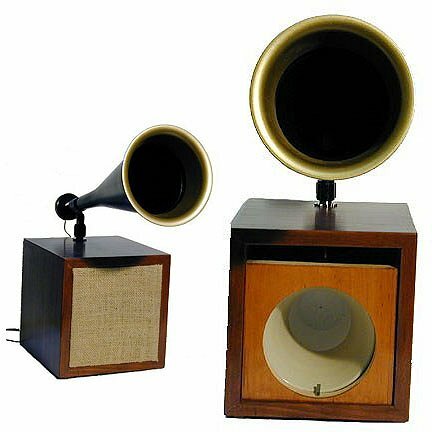 Keep in mind, to appreciate this speaker your crystal radio must first have very good/loud reception conditions. You must be near a powerful station or have a very substantial antenna system or both. I live about 25 miles from the nearest station. I've constructed a fairly elaborate antenna system in the tops of the trees around my home. This speaker can, and does clearly fill my whole living room and behond with sound! The cost for parts to build it will be around $40.00 or less. If you do build it, please let us know what you think of it. 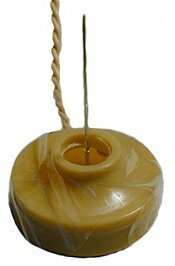 One Automobile Transmission Fluid Filler Funnel (Measures 17 inch long X 4.75 inches wide mouth). Two inexpensive, Plastic Megaphones (Measures 8.25 inch long X 6 inches wide mouth), you can get them here: www.imprintsonline.com/doc/megaphones.htm Tell them you would like to purchase some samplers. 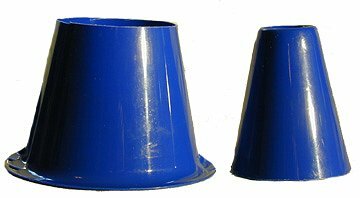 One Styrofoam cup (Measures 4.75 inch Tall X 3.50 inches wide at top/mouth). Two Straight Pins, there are large size and small size pins available, use the small sized ones. Epoxy, comes in two parts, must be mixed, or JB Weld, comes in two parts, must be mixed. Click on the small pictures to see detailed pictures. Unscrew and discard the little clear plastic ear piece from the earphone. Use a small piece of 120 grit sand paper and very gently sand a spot in the center of the tin diaphragm. Be careful not to sand/push to hard or you may damage the diaphragm, it's fragile! This step is to insure that the pin & JB Weld will adhere very well to the diaphragm . Mix the JB Weld as directed on product container. Be sure to mix it using exact equal parts, this is important or it may not harden up as it should. Place a small dap of JB weld in the center of the diaphragm were you have sanded it. Be careful not to use to much. I used a wooden toot pick to apply the JB Weld. A little dab will do ya! To much will have negative effects! Stick a piece of clear Scotch Tape or equivalent over the entire opening of the earphone hole. 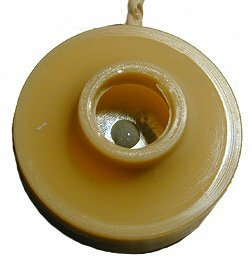 Use the sharp end of the Straight Pin to poke a hole through the clear tape directly above where the dab of JB Weld is located on the diaphragm. There are a few different sizes of straight pins available. Use the small size pins for this project. Using a pair of wire cutters, cut the head of the straight pin off. Sand or file the pin smooth where you cut the head off. Once you have the hole poked through the clear tape then insert the Cut/Sanded end of the pin through the hole in the tape, being sure that the pin comes in good contact with the dab of JB Weld and diaphragm. The clear tape will allow you to see where the pin needs to be positioned into the JB Weld. It also servers as a support for the pin so the pin doesn't fall over while the JB weld hardens, keeping the pin in a plum position. Allow the JB Weld to harden for a minimum of 24 hours. Once the JB Weld has hardened, use a sharp razor blade and very gently remove the clear tape from the earphone, being very careful not to disturb the pin. Now your Styrofoam Cup Speaker drivers are complete. This project requires two of these crystal speaker drivers for best results. So build 2 of them! Cut off the small end of the plastic Megaphone. 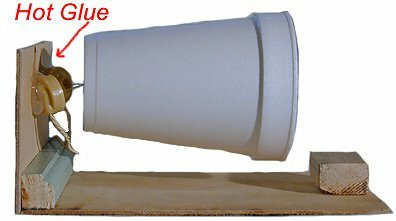 Using the styrofoam cup as a guide, slit it over the small end of the Megaphone, making sure the cup and megaphone are perfectly aligned. Now make a clear mark around the circumference of where the large portion of the cup ends on the megaphone. Now add 1/2 inch from where your cup mark is then cut it to this length. The megaphone should now measure approx. 4 1/4 or so inches in length. You want the shortened end of megaphone to fit approx. 1/3 inch or so down inside the mouth of the cup. 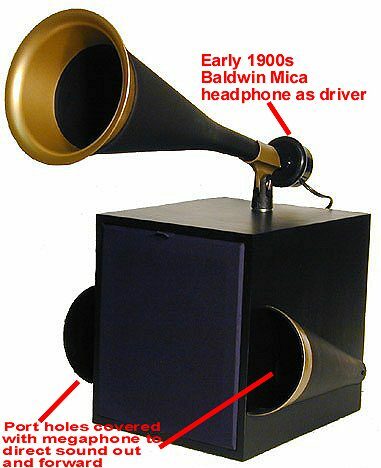 You will need to construct a base for the speaker. I've used some wood scraps from around the house. Some old wood paneling is what I used. Plus a couple pieces of wood trim stock. 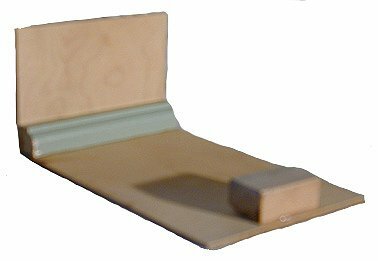 Once you have the wooden base constructed now it's time to attach our earphone drivers to the styrofoam cup and anchor them to the wood base. Mix the epoxy. Be sure to mix it using exact equal parts, this is important or it may not harden up as it should. Dip each pin point into the epoxy so there is a very small amount on the pin points. 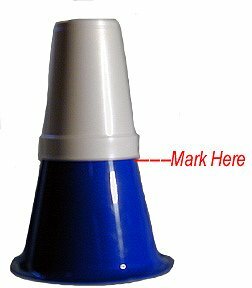 Insert the pin into the center, back side of the cup just to the point where the pin penetrates through to the inside bottom of the cup. Do this with both drivers, at an angle as pictured. 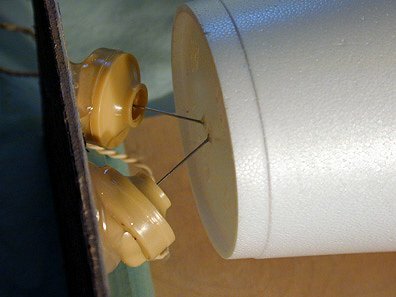 Now place a tiny amount of epoxy where the pin points are visible in the inside bottom of the cup. Be sure to use a very tiny amount, apply with a tooth pick or needle! This will hold the drivers/pins securely in place, keeping them from coming loose from the cup. Let the epoxy harden for 24 hours. Now the cup is basically just hanging from the pins and drivers. This is a fragile stage so be careful not to break the pins loose from the cup. Next step is to HOT GLUE the cup and drives to your wood base as pictured. As you see in the picture the cup and drivers are now hanging from the wood base. This is another fragile stage so be very careful with it. 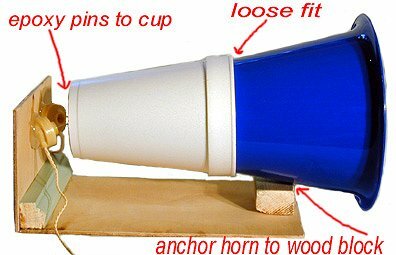 Last step is to slide the shortened megaphone into the mouth of the styrofoam cup and anchor the megaphone with a screw or hot glue to the little wooden block to stabilize the whole thing. It's important NOT to push the megaphone to tightly into the mouth of the cup, you want a very loose fit at this point or it will diminish the volume of the speaker. Now the first part of your speaker system is completed! The Styrofoam cup speaker portion assembly is very fragile so handle it at all times with great care. Once you have it mounted into a cabinet then it we be well protected. Using a fine tooth hack-saw, cut approx. 1.5 to 2.0 inches off the small end of the funnel. Sand or file the cut end smooth and even. Now take your second plastic megaphone and cut the large end off so it measures right at 2.25 inches long. As you can see I have painted my funnel and megaphone. This will give it a nice finished look. The Filler funnel is a bit rough from the factory. They may have alot of excess plastic molding hanging onto it. The mold seams are also a bit crude looking. I have used a fine file and sand paper to clean this all up. Then I spray painted the whole thing with some black spray paint. Same goes for the shortened megaphone. I used some quality GOLD spray paint to finish it off. It's best to finish sand the surface of the shiny/smooth plastic with 400 grit paper to assure the spray paint will bond well to the plastic. Disassemble your headphone set. You only need one side of the headphones for this project. Now unscrew the cover cap from the headphone. Using a small drill bit, drill a pilot hole through the very center of the cap. Then using a larger drill bit drill the center hole to a diameter of approx. .75 of an inch. No larger! Once you have the funnel and cap cut/drilled to fit properly then mix up your epoxy and glue the two pieces together. Be sure not to use to much glue. Do a nice clean gluing job. Remember it's very important that the tin diaphragm does not come in contact with anything when you screw the phone cap back onto headphone diaphragm portion. As you can see the finished horn resembles a vintage RCA Victor horn speaker that you may see on an old crankup cylinder type phonograph! All you need to do now is connect all the wire leads of the 2 earphones (styrofoam cup speaker) and the headphones (Horn speaker) together. First connect the styrofoam cup speaker wires together. Each earphone has one positive wire lead and one negative lead. 4 wires total. It's nearly impossible to tell what leads are + and what ones are the - leads coming from the earphones. So connect the four leads together to make 2 leads total. 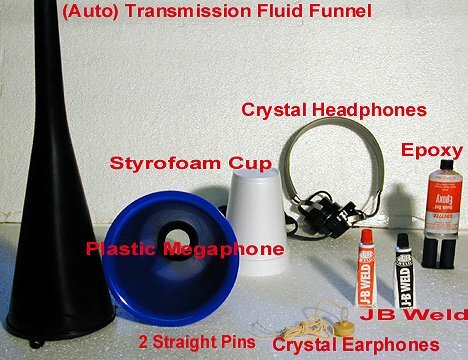 Hook up the styrofoam cup speaker to your crystal set. Pay attention to the speaker volume. Then unhook the leads and revers the polarity of the 4 wire connections. You will hear that one way is louder then the other. This tells you when you have both the + leads hooked together and both - leads hooked together correctly. No worries if it doesn't have alot of volume at this point. When you connect the "horn speaker" leads together with the cup speaker leads then a magical thing happens. The headphones and earphone are made with two different types of technology, when the two are wired together it creates an amplification of sorts. This is one of the reasons this system operates so well! I will leave the cabinet building up to you. Just keep in mind that a well made cabinet is a very important part. The styrofoam cup resonates sound from it's entire surface. When it's place inside a cabinet it traps all this sound and directs it out through the front of the speaker cabinet. Be sure to create a port hole in the face of your cabinet so this sound can escape. Look at the finished speaker cabinet (Click here) to see the long slender port hole I build into the top portion of the cabinet. If I were to do this project over (pictured here) I would make the cabinet a little taller and also make the sound release port about 2 inches high instead of the 1 inch high you see in the picture. This will enable the traped sound to be released out the front of the cabinet more efficiently. 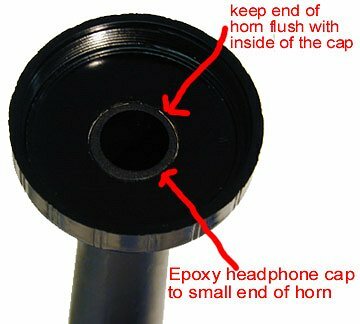 I used a stand up microphone mount clip to connect the horn speaker to the wooden cabinet. This give it the ability to pivot from left to right and up and down. The microphone mount clip is perfectly shaped to fit snugly onto the tapered form of the horn. Or one could use some PVC parts along with flexible gas tubing for the mounting. Flexible gas line tubing can be purchased at any store that sells propane or natural gas heaters. 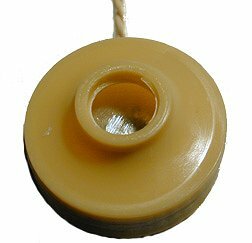 This speaker will operate with ANY type of an AM crystal radio, no power needed. I've even tested it on one of those cheep little reproduction Rocket Radios and it performed outstandingly well! We believe there has never been any type of a loud speaker for a crystal set developed before that performs the way our "STYROPHONE" Speaker performs! Try it, you will be very surprised. It's well worth all the effort! If you do build this speaker system I highly recommend you do it EXACTLY as we have outlined above. Using the same identical parts shown or you may not get the results you desire!